Last year I lived on three tropical islands. Three of the most beautiful places on earth. Three of the neediest countries on earth. Ah, but what a lovely life I lived. While I don't have any intention of moving back to any of those places, increasingly, I will feel nostalgic about one or some of them. A few weeks ago I was chatting with a friend about diving. I am not a diver, but I know that Timor Leste is supposed to be one of the world's gems of diving. A pang of homesickness hit me as I remembered the time I dropped a friend off at a dive centre for her day's excursion. The dive centre was in the same facility as a posh restaurant where I had an inspiring business meeting. 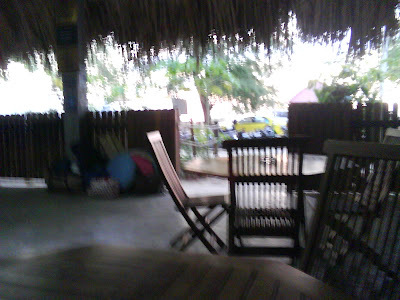 The restaurant was overlooking the pristine blue sea, with palm trees framing the view. And so on and so forth. I can't remember right now what brought back memories of Indonesia. Someone asked me if it's a nice place, but I can't remember who was asking. I think they asked because I told them that I absolutely adored working in Indonesia. I had the best colleagues who were so kind and so motivated and so on top of their game. And, yes, it is absolutely gorgeous. It is, of course, the world's largest archipelago so it's not really fair to generalise. 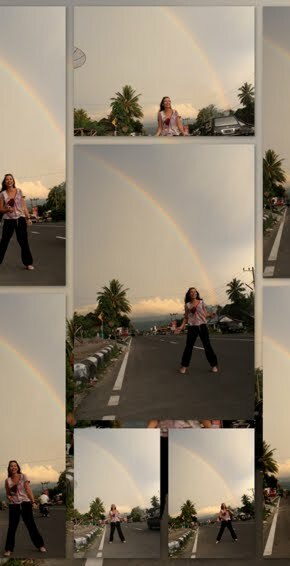 I lived in West Sumatra, home of the semi-famous Lake Maninjau. Click that link and take a moment to ponder that I took that photo with my unimpressive phone camera. Yeah, beautiful is an understatement. I didn't have to take any photos in Sumatra, because one of my colleagues is a brilliant photographer who loves to share. I love this photo she took of me in the rice fields next to the Lake, about a half hour from the hotel-turned-office where we worked and lived. We were helping people build temporary houses to live in after their houses were destroyed in a major earthquake. What a lovely place, and a lovely people. Then, just this evening, I was chatting with a former colleague who is currently in Haiti. It was a brief chat, but in the course of our conversation, she reminded me of the amazing house where I lived, some awesome colleagues, and the great food! Haiti is full of contrasts and those contrasts just increase the searing pain of life on that half of the Espanhola island. It's an exhausting, intense place to be. But so full of life, perhaps the most 'full of life' place I've lived in for a very long time. 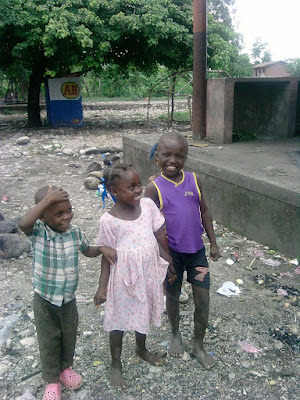 All my friends on Facebook who live in Haiti are active posters of photos so I never felt the need to take my own. But I just realised that I DID take a few photos, for an assessment we were doing in a rural area regarding people's needs in water and sanitation. Great fun, right? But here's one photo to share... see how full of life these kids are? I miss that. And the food. Oh what I wouldn't do right now for some Haitian food, on a Timorese beach, with my Indonesian colleagues... Or some posh food from a Timorese restaurant with some friends from Haiti in the Sumatra mountains... Or just to get to magically visit each place for a few hours. So after I heard that statistic, I was summoned into the enormous building in downtown Cairo where all - yes, ALL - the country's bureaucratic paperwork is done. A colleague and I followed our bureaucracy expert guy into the sprawling boundless complex. A girl checked our bags then we headed up the stairs with about one hundred other people. We lost our fixer and almost went to the wrong office, but thankfully I caught a glimpse of his white head about two dozen people (and two metres) away from us. We followed him through a labyrinth of hallways to get to the visa desk, where we were required to report. Now, here's the thing. As we walked past throngs and throngs of people, certainly more than a thousand on just one one floor of the giant edifice, I realised they were all crowding up at service counters. And behind those counters were busy clerks. There were many, many busy clerks, but there were more people vying for their attention. Those clerks were certainly working more than 7 minutes today. They were also mainly women. So now I have an image of, for every busy woman handling the crowds, a dozen men sitting in a back room somewhere drinking tea all day long. Just to average out the 7 minutes. A few weeks ago I blogged about the sweet older very-Egyptian man who runs a laundry shop a few blocks from my hotel. I did laundry again this week, and was pleased that they recognised me and gave me a discount for being a repeat customer. I decided that with the discount I wouldn't trouble them with a receipt for reimbursement; I'd pay it myself. Three weeks of laundry for 10 bucks, not a huge sacrifice, right. Plus I wasn't convinced he had another work-of-art receipt tucked away in his agenda waiting for me. So I just paid for my clean clothes and came back to my hotel room, put my clothes away and imbibed of the beautiful smell of freshly laundered fabric. He uses a nice fruity detergent. I'm living in a unique alternate universe right now, the universe in which "the day of youth" has come. Formerly, young people were seen as a minority, disenfranchised - like the Dalit of India perhaps. "Children should be seen but not heard", to the extreme. Now something has changed, and the oppressed are standing tall. This is the day of youth. I even wonder if we shouldn't say the oppressed has become the oppressor - after all, if the world is in the hand of youth, what does that leave for everyone else? The thing is, it's a little hard to fathom how a minority can be an age group? Does it mean that when the days of one's youth are over, that person's productive role in society is over? Do today's youth realise that by taking pride in their age, they are setting themselves up for failure? In fact none of this is true, and the older generation is just as proud of what has happened in Egypt as are their younger counterparts. They have been slowly working toward this goal not for months or years, but for decades! But it is also true that they were not able to pull it off without the energetic mobilising efforts of their progeny. So to Egypt's youth, I want to say, remember not who you were, but who you will become. Remember who brought you into this world, who taught you, who supported you. Keep your energy and passion high, but also remember that you are the majority - 70% of the population - and consider the possibility that you mobilised more people simply because there were more of you to mobilise. Remember that the old way of doing things belonged to a small bunch of people, not to everyone who is older than you. Please, today is a new day, and do the right thing. Please don't perpetuate the disrespect. You are standing tall, and the world is saying that this is your time. Do the honourable thing, the difficult thing: after suffering disrespect for so many years, now you can shame those who disrespected you by insisting on showing them respect. Build a society of tolerance not only for different religions, not only for women and men, not only for uneducated youth or people from other countries, but for your own parents and for who you will soon become. Then, maybe one day, you and your children will be able to stand up together. I'm just a tad unnerved by the realisation of how little anonymity I can have on this blog. Either I hide every single detail about myself, or I accept that every minute detail can be known. I tend to strive for a happy medium, something that is true and informative, but not too intimate. But that doesn't work. For the resourceful surfer-hacker out there, all can be uncovered. So today I think I will ponder the concept of intimacy. If you've been following my blog lately, you know that I've been putting a lot of energy into rather weighty topics. More than usual, that is. After all, I'm a sociologist, so deep thinking is my trade. While I prefer to write my portraits, these days, it seems the portraits are consistently pointing me to analysis of some sort. I'm not doing such a great job of enjoying those portraits merely for the beauty of the people I'm attempting to portray. Instead I'm probing, analysing, seeking. I feel like if I understand their story, perhaps I will understand my own story just a little bit better. During the past week some colleagues and I have been meeting with local youth networks and they have been drawing their social maps for us. The social maps are a good reminder that everything in our world is interconnected. Your life may overlap with mine only through this blog, or through reading each other's blogs. But what happens to me impacts you in some small way, and what you learn can be insightful to my own view of the world. It's a beautiful thing, this interconnectedness. And yet, you might posit, this blog is so introspective, it shares so much! That's what I used to tell myself, but I'm seeing that voluntarily peeling back one layer of skin is a great way to get out of having two or three or four layers ripped off. Generally, avoiding deep wounds is a good thing, but there are also many instances in which the wound is needed, if for nothing else than to heal a yet-deeper wound. There is a lot about myself that I don't acknowledge even to myself, and much more that I don't acknowledge to others. Part of it is my reaction to my lifestyle, which has left my skin too tender to react to further cuts in a healthy way. Raw, irritated skin probably can't handle more than one layer of removal. But habits die hard, and if it's not something I do, I'm not sure how it's something I would learn to do. And that's about all I have to say about that, because this blog is an acknowledgement of what is, not an attempt to peel more skin. Not yet, anyway. I didn't write this story. It's actually a modified version of a case study collected by a colleague last week, and I've been working on translating it tonight. But it's what's on my mind today and I found it to be encouraging and so I thought I'd share it with you. The story probably needs some background to really make sense, but I hope you at least enjoy the spirit of what this lovely woman is saying! I am 39 years old, a housewife, and I live in a camp for displaced people. I am from one of the Noo tribes - originally from a part of the Noo Mountains known as the six villages, of a tribe called K. My village is located east of our tribe's mountain and is bordered to the west by an agricultural project where they grow sesame and bread and corn and cotton. I am descended from a Muslim family both by my father and my mother's father. I now live with my husband and my three children. My husband was working in the Military army, but was transferred out, and he now works as a day labour construction worker. I first joined the women's savings group 13 months ago, and am in my second cycle of savings. The savings group is called “Togetherness”. I heard about the savings group idea through my husband, he told me that there were girls teaching the women in Block 15 and gave me the name of the teacher there. He said, "There are people who have a savings fund and I spoke to the leaders of the group and told them to come here." I went, along with some of the women from my block, to Block 15. We met the teacher and we agreed to hold a meeting with the women of Block 37 to tell us the idea behind saving. I did that because I really wanted to do something for women's development in the Block. Our group means togetherness - people are interdependent with each other, solving the problems of others and solving our own problems. So saving together creates a unique social fabric. I did not know members of the group before but now relations are strong among all the members of our group. Before, I didn't know that savings together would mean things like a constitution and laws and fines. The most important element was to have a regular meeting of all members in one place, as we do in our group. This means that social relations are strong between me and the women, women who I did not even know before. For me, everything about my life became completely different, even the my daily routines changed: before I didn't have anyone by me I could consult about my needs, and I'd only want to talk to my family who don't live near me. The second thing is that I visit all the women of my group on a regular basis, we have become like one family. In general, we have been sharing a lot of traditions and customs among members of the group, especially since most members come from different tribes. First, we learned folk dances, and then also we have exchanged cuisine traditions such as the number of food dishes with tomatoes that you cook with water from the watermelon and different spices. One time, one of the group members took a watermelon and brought a whole plate of the dish to the group members. Some of the other women brought different dishes such as one with leaves from a watercress tree, and onion tree leaves, and also radishes and chilli leaves with spices as well. The members all take part in all of it. Members also shared seedlings with each other. Our house was lacking some of the things that my husband can't provide me, but by saving I was able to set up my house. The most important thing is that my daughter is in peace. She had left school because of her father's inability to pay tuition fees, and thank God, with the savings, I was able to pay for her and she sat for the final exam, and everyone in the house was happy. We didn't lose a whole year for her because of tuition fees. So you see, the savings group has provided each family member with some benefit, thank God. This morning in a local English-language newspaper, there was a photo of people dancing on the streets in D.C., next to a quote from a local bloke saying that he can't help but feel a bittersweet sadness about the whole thing. Osama Bin Laden's demise has been the watercooler topic of choice today in my office, at least among the internationals! All of us seasoned expat aid workers with Middle East experience had roughly the same reaction: we are not mourning per se, but we don't like the image of partying either. In general, my colleagues feel that celebration makes Americans look like barbarians, takes away whatever credibility or global solidarity we may have merited, and illustrates what's wrong with the U.S.'s image in the world. They pointed out that celebrating death today has invalidated our righteous indignation when Palestinians partied after 9/11, and now it is we who deserve the resentment of victims who have lost loved ones. One colleague took it a step further and pointed out that this was a well-timed political move on the part of the U.S. administration. I might take it yet another step further and recall the Postmodern theory behind the film Wag the Dog. Click that link: that book will totally mess with your mind if you haven't heard about it before. A bit sensationalist it may be, but in tale of the Hunt for Bin Laden, it makes resonates to me. Are we sure he really died two nights ago? It wasn't a look alike? He was not a young guy and he lived in caves; does no one but me wonder if he didn't really die of old age 5 years ago? Either way, I pray for mercy and I pray for the grace to pray for his friends and loved ones, and for the others who died in that raid. Furthermore, I find myself wondering, does his death really matter, in the historical sense? Has al-Qaeda been defeated? Has justice been done? I fear that we may just have further fanned the flames of global hatred. Some groups are already declaring revenge for the famed leader's death. So do we really think that, when all was said and done, killing this famed terrorist will have been worth it for the West, particularly the U.S.A.? What if his death inspires more terrorists to take more lives? From the very beginning, I believe 9/11 could have been an opportunity for the U.S.A. to show the world how to turn the other cheek, the Ghandian and MLK teachings (teachings they learned from Jesus!) about the power of nonviolent resistance. When I read about nonviolence, I read of something very difficult to do but very powerful in its impact: in this case, it would mean defeating war by declaring peace. I tried hard not to offend anyone in writing this, and if I did, I apologise. I'd love to hear your thoughts and think it through together.